Hi! My name is Sara Flick! I love making vacation wishes come true as a MickeyTravels Agent! I was born and raised in sunny southern California, just a short drive from Disneyland. My love of all things Disney started when I was just 3 years old. Even at this young age, I have vivid memories of holding my grandmother’s hand while walking down Mainstreet at the Happiest Place on Earth. It was then that my heart filled with the magic of Disney. I remember each wonderful smell and how I felt when I caught my first glimpse of Sleeping Beauty’s majestic castle in the distance! These memories have only multiplied and become more precious over the passing years. I was blessed to marry my very own knight in shining armor; a U.S. Marine. We currently live in Connecticut and have three amazing children. I now get to experience the joy of seeing that same magic in their eyes as we stroll down Mainstreet together. 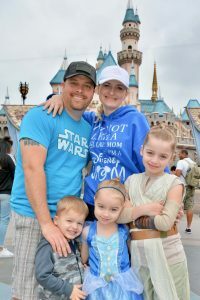 As a family, we make sure to visit either Walt Disney World or Disneyland each year to make more magical memories together.